Hazel-Atlas made glass during the depression era. These marigold canning jars show up occasionally at Carnival Glass auctions. 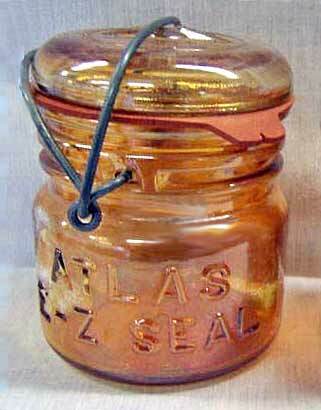 In 1996, a one-half pint jar sold for $115. This one-pint jar sold in 2006 for $225. Yet another sold in 2012 for $25. Photo courtesy of Wroda Auctions.